The pot of gold is secured: the Rainbow II replica project is official, and spectacular. 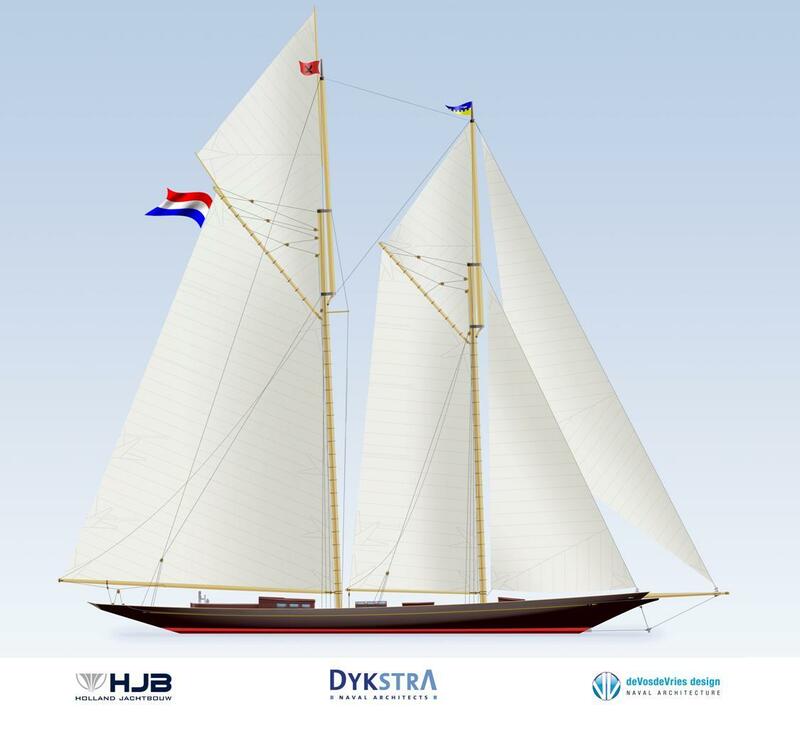 Naval architecture is by Dykstra Naval Achitects, with launching and completion set for 2016. Holland Jachtbouw of Zaandam, Netherlands, has secured the project contract, with the inevitable aluminium hull (described in the blurb as “traditional”) to be constructed by Shipyard Made in Moerdijk. 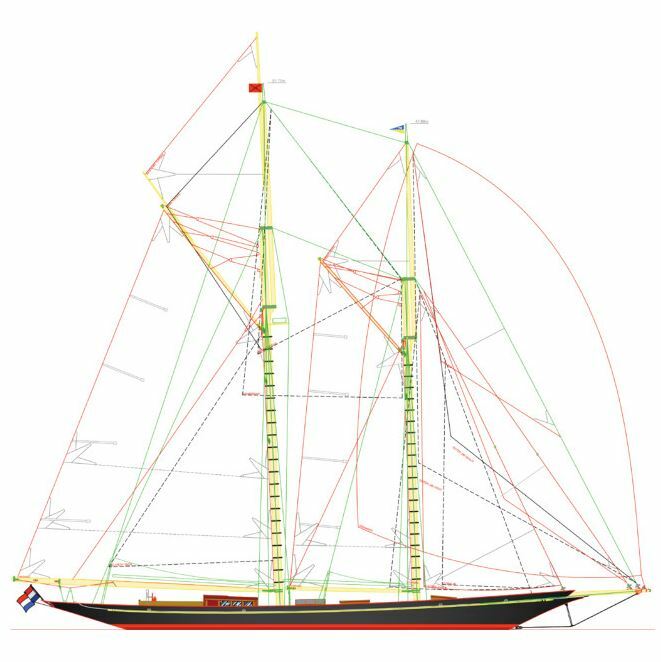 Interiors will be by deVosdeVries Design and wood masts and spars by Ventis Scheepstimmerwerk of Enkhuizen, who last year undertook various shipwrighting necessities and the making of a new mast for the Fife 8-Metre Saskia. Here’s the original Rainbow racing at Hunter’s Quay, on the Clyde, in 1899, courtesy of IFI Irish Film Archive. 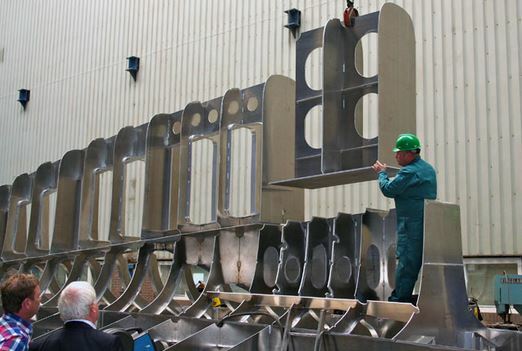 Keel laying of Rainbow II / Hamburg II at Sheepswerf Made, Holland, August 2014. Nobody is admitting her as a true replica, but which name from the famous G.L. Watson-designed, D&W Henderson of Partick, Glasgow-built 1898 schooner will she take? Martin Black’s beautifully illustrated and written biography, G.L. Watson – The Art and Science of Yacht Design, can be purchased online at our website www.peggybawnpress.com, from Amazon UK and Amazon USA, and from the bookstores listed here. 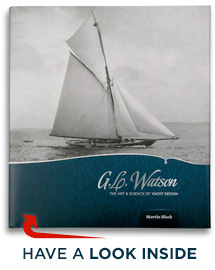 496pg biography of Scottish yacht designer, George Lennox Watson (1851-1904). Significant book on the history of yacht design & the development of modern yachting. Beautifully illustrated. Many photographs previously unpublished. This entry was posted in Baltic Germany, Big Class, boatbuilders, boatyards, Clyde yachting, film, G.L. Watson, G.L. Watson & Co., Glasgow, naval architect, object of desire, other yacht designers, replica, shipyards and tagged deVosdeVries Design, Dykstra Naval Architects, Enkhuizen, Gerry Dykstra, Hamburg, Hamburg II, Holland Jachtbouw, Moerdijk, Orr-Ewing, Rainbow, Rainbow II, schooner, Sheepswerf Made, Shipyard Made, Ventis Scheepstimmerwerk, Zaandam. Bookmark the permalink. I donot mind the coamings at all. It is the rig that really sells it for me. (I was actuallly expecting a carbonfiber rig before the press release mentioned wood). It is easily one of the boldest projects since the Herreshoff schooner replicas. Peggy, of Casteltown: the world’s oldest yacht? Ireland to starboard, or port? Stories archive October 2012 to September 2013.